I'm sooo fat. . .
HA--kidding, I've gained one pound since my last doctor's appointment a month ago. . .really gettin big! Baby is growing but they have changed our due date to Dec. 10th instead of Dec. 3rd. I feel better than I did during my 2nd month but have been getting horrible headaches mostly in the evening as well as some puking after I eat dinner--Lovely! There are a ton of pics so if you prefer a quick run through click below on the slideshow--it's awesome and brings tears to my eyes each time I watch it. Last day of being 32. . . I thought since my 33rd birthday is tomorrow I'd reflect back on year 32. . . I moved away from Queen Anne and got to live in West Seattle for awhile--loved it. My family had a really fun vacation in Eastern WA thanks to Kyle & Amy--I hope we can go back again sometime soon. The weather was fantastic and so was playing Cranium!! Kyle and Amy announced they were pregers with Baby #2. Griffin LeRoy was born on April 7, 2009. Kora moved away from me back to Olympia--I really hope that's temporary, I miss her! I got to watch Joe as the QB1 for North Thurston Football, no injuries this year-thank goodness. I got to be with Leah when she found her wedding dress and she was with me when I found mine. .. all in one weekend! Zach and I had two fabulous vacations--one to Hawaii and one to Whistler. . .I would love to be back in Hawaii right now. I had a wonderful girls weekend getaway to Scottsdale for lots of sun and relaxation. I pretty much wore two things, my bathing suit and bathing suit cover up. I enjoyed a Thanksgiving dinner NOT at my mom and dads but at Kora and Nicks. It was really fun to have the entire family pitch in with all the food and Nick cooked up a fabo turkey. I moved to Woodinville during a snow storm. I now own the house in Woodinville with Zach--first time homeowner for me! I had the best wedding shower and bach party anyone could ask for. 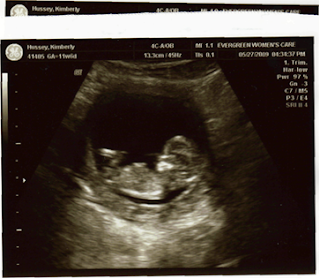 I found out I was pregnant the week before my wedding!!! So what will 33 bring me? :) I think some kitties and a baby for sure! I am so blessed to have such a wonderful loving family and friends and the best husband ever--you all helped make 32 such an exciting year. thank you- I love you!